Local viewing is a common problem for VMS software based systems. Even for DVR/NVR appliances with direct video output, if the video needs to be viewed elsewhere, it typically requires a monitor and a PC. One solution gaining attention is deploying super low cost open source based appliances as spot monitors 'PCs'. These units, costing $50 or less, can replace a traditional Windows based PC. Both are fairly tiny, with the Pi about the size of a pack of playing cards and the Mini PC about the size of a lighter. Overall recommendation: use with caution and make sure to test yourself before deploying. While the units are inexpensive, both had issues that increased time needed to setup, troubleshoot and/or optimize the systems. However, given their low total material cost, if you plan to use this regularly on projects, it is worth considering. Performance will almost certainly be lower / slower than what would be delivered with traditional spot monitor output from DVRs or from a dedicated 'real' computer. Both appliances ran relatively sluggishly, even for basic operation, not involving video streaming. While it did stream video, expect it to be a low frame rate. The Android Mini-PC is far easier to set up than the Raspberry Pi. On the physical side, the Android Mini-PC comes with most everything you need to use it right away, both on the hardware and software side. By contrast, the Raspberry Pi is literally just a board, requiring you to buy a power supply, case, SD card, etc. Plus, the Raspberry Pi requires downloading and loading the OS yourself (see setup guide). None of this is rocket science, but it adds cost and time. The Android Mini-PC is far simpler to use for non technical users than the Raspberry Pi. The Android PC operates like most other Android devices. If you have used an Android smartphone or tablet, this should be no problem. By contrast, the Raspberry Pi's software is based on a Linux distribution. If you have no Linux experience, you will likely be confused and frustrated as it requires execution of more manual commands. 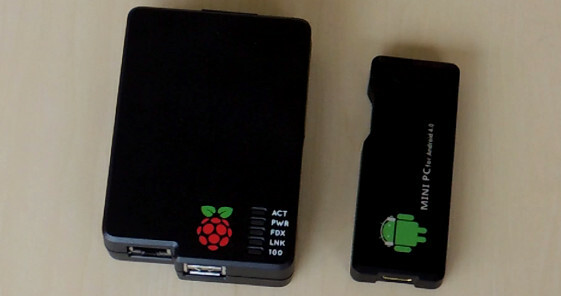 The Raspberry Pi operated far more reliably than the 3 Android Mini PCs we tested. With the Mini PCs we had various issues getting them to run. The good thing is that they are so cheap and simple to install, that it is fairly easy (and probably desired) to just buy extras. Also, there are many different OEMs and versions of the Android Mini PC making these even more complicated. The Raspberry Pi (Model B) comes with built in 10/100 Ethernet NIC while the Android Mini PCs are wireless only. You can add a wireless adapter to the Raspberry Pi but you need to be comfortable with Linux system administration (see these instructions). The Model A has recently been released but avoid this one. It is $10 less but comes with no Ethernet interface, which makes it a problem for surveillance applications. The plus side of the Raspberry Pi's wired support is that you have a steady and direct connection for your spot monitor / viewing station. By contrast, using the wireless for Android PC may create issues with connectivity and location of the station in certain areas. The Android Mini PC supports Android apps, which means you can choose from a wide variety of surveillance applications on the market. By contrast, the Raspberry Pi does not support Android. Moreover, it is based on an ARM architecture, not the more common i386. Even if you have a rare VMS thick client that runs on Linux, it may not support the Raspberry Pi (e.g., this is the case with Exacq). With the Raspberry Pi, you are most likely restricted to using the recorder's web client. The Android Mini PC is an interesting option for a low cost, tiny Internet TV / video player. By contrast, for those more technically inclined, the Raspberry Pi is a real neat platform for programming and other tech tasks. Oh, and the Pi is adding on a $25 HD camera interface soon that will make it an IP camera. While it will not replace 'real' IP cameras, you might enjoy playing around with it.